An apartment on my floor was destroyed in a fire the other night. This is the second time that’s happened on my floor. The last time was about three years ago, when 5B, the apartment next door, went up in flames. I was out at basketball and Sari was at a yoga class, so the firefighters broke down our door to make sure no one was home. 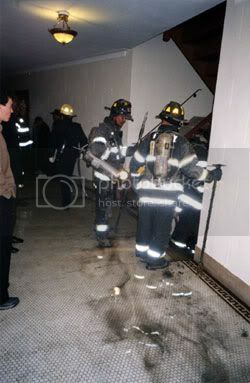 They also broke out the window in our bedroom, ostensibly for safety reasons, so the fire wouldn’t spread or something. (Thankfully, our building is old, brick, strong, and well-designed to keep fires from spreading.) Anyway, there was a hell of a mess for us to clean up, but amazingly enough, no damage — unlike 5B, which was trashed. This time I was out playing basketball again (Sari also wasn’t home again), and I returned to that same heart-stopping sight of the firetrucks and ambulances in front of my building. Thankfully, no one was hurt in either fire, but this most recent one, in 5I, was a real bad one; the whole place is gutted. Word is the damage is so bad, it’ll be at least a year before the occupant will be able to move back. Supposedy, the fire was started by a cheap extension cord attached to a radio. The woman was out of the country at the time, and was due to come back the next day. I feel real bad for her. How can you predict an unattended radio will set fire to your apartment? Sheesh. After the fire in 5B, Sari & I purchased insurance for our place, and made noises about backing up our files and keeping them in a safe place (i.e., not in our apartment). I also bought a little fire extinguisher. Whatever we could save, however, wouldn’t be enough. Seeing this damage so close by, just a couple of doors down, reminds me (of course) of Katrina, and how every individual person down there was affected. Two fires on the same floor of the same building really makes you think — is this floor cursed? Are we next? Maybe what I should be investing in isn’t fire extinguishers and backup systems but one of those tokens that wards off the evil eye. Shoo! Shoo! You can purchase a fireproof strongbox for important documents fairly inexpensively. Supposed to survive a fire if the building burns down. dude, you’re like a SURVIVALIST. just you and the cockroaches will be left when it’s all over!